Leo Keehan died on Tuesday, at 89. He was a lifelong Westporter, a 1947 Staples High School graduate — and a man with an intriguing connection to our town’s transportation history. Leo owned 3 businesses here. One — Teddy’s Taxi — was located for years on the eastbound side of the Saugatuck train station. It shared space with the local Avis rental agency — which he also owned. Noticing growth in the number of trips to New York airports, he added a limo service: Teddy’s Limousine. In the 1970s, Westport was selected by the state government as an ideal town for an experimental local transportation system. 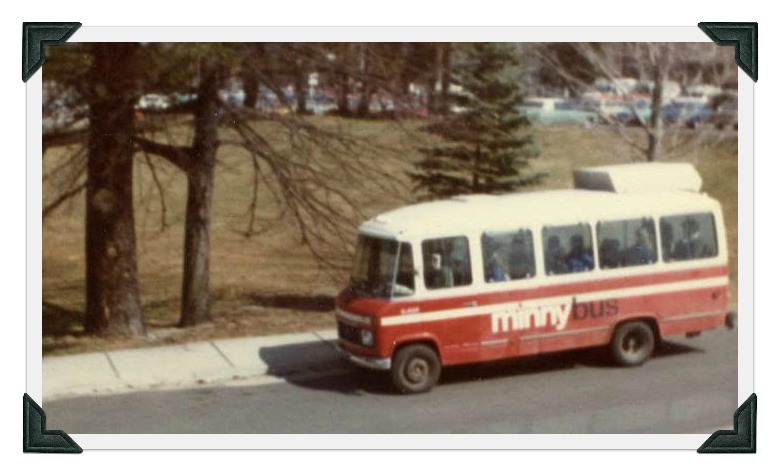 In the first phase, Mercedes “minnybuses” followed fixed routes to and from the station, taking commuters to the train each morning and bringing them home at night. In between, the buses ran routes connecting downtown with outer neighborhoods. Inexpensive passes allowed Westporters to ride minnybuses without limits. Parents quickly realized the buses were cheap babysitters. They put their kids on, and waved goodbye, occupying them happily for hours. The second phase — “maxi taxis” — was a van service. Several customers sharedrides to points around town. A Minnybus at Jesup Green. Leo was recruited as president. Both programs ran successfully, until funding ran out. Leo sold his businesses in his early 50s. Retirement lasted only a year. The family that purchased Teddy’s wanted his expertise to grow the business. Twenty-five years later he retired permanently from Teddy’s’ — a job he truly enjoyed. Leo was a Korean War veteran, stationed in Germany. After returning to Westport he began working in the auto parts industry. He married Beverly Breault, daughter of Gilbert and Breault — original owners of Ye Olde Bridge Grill. 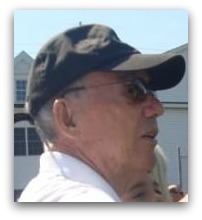 Leo lived at Compo Beach for more than 45 years. He loved the water, and sailing. The Keehan family has been Westport residents for over a century. His sons Kyle and Scott both live in town, and hope to keep their family here for another 100 years. A celebration of Leo’s life will be held on Friday (January 25, 10 a.m., St. Thomas Aquinas Parish, 1719 Post Road, Fairfield). In lieu of flowers, please consider a donation to the Wounded Warrior Project. This entry was posted in Local business, People, Transportation and tagged Leo Keehan, Teddy's Limousine, Teddy's Taxi, Westport maxy taxi, Westport Minnybus. Bookmark the permalink. In the mid-70’s I spent a summer driving part-time for Teddys. I don’t think I ever met Leo but his dispatcher was a trip. Chain smoking his menthols and his raspy voice over the radio was a pleasure… Driving the drunks home as they stumbled off the train, making sure the newly arrived Swedish Au-Pairs arrived safely and the limo trips to Kennedy in under an hour were memorable. I am embarrassed I can’t even remember his name but I sure like that man. LEO’S PARENTS, LEON AND ISABEL(?) KEEHAN LIVED ON OTTER TRAIL. HIS FATHER EITHER WORKED FOR OR OWNED THE BLUE RIBBON GARAGE/AUTO SERVICE ON RIVERSIDE AVENUE. CONDOLENCES TO THE KEEHAN FAMILY . . The night dispatcher’s name was Harry and he always had a cigarette in his mouth and another going in the ashtray as backup. Funny you remembered that. OF COURSE! Harry… When it was slow (rarely) and when Harry was in a good mood (even more rare)… he told some great stories. Wonderful family, really unsung heroes who quietly made Westport what it is. My sincere sympathy to the whole family. 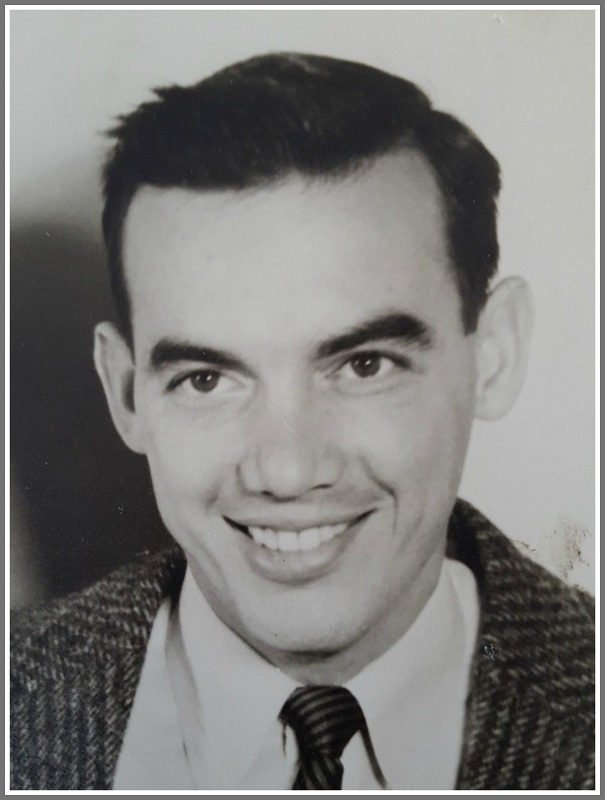 Hi All: Harry Sewall was my Dad.So interesting that a dear friend sent me the article because I had been thinking about him lately. He really enjoyed working at Teddy’s Taxi and Avis Rent A Car. And loved meeting all the people coming off the train and getting to know them by driving some of them home. He particularly liked Sandra Dennis. They became friends. She had all those cats! He was a true character, a kind and humble man who deeply cared about others. He definitely had a gruff side as well. You know I always felt bad for my Dad because he never knew his parents. He was raised in Spartenberg, SC by a wealthy guardian who had a plantation and had adopted my Dad for who knows what reason. We can suspect that Dad was born into the family or that Mr Shepard had gotten someone pregnant. According to my Dad, Mr Shepard never spent any time with him. He was basically brought up by an African Woman, that is the south in those days was called, a Mammy. He was then shipped off to Catholic Boarding School from the age of 11 and not sure at what age he was told that Mr. Shepard committed suicide. I think that is why he really wanted to be what I call “A Light Worker”!! Funny someone should mention Swedish au pair. I was an au pair in Westport from Jan. 1967 to Oct. 1968. I’m Danish, and had several girl friends that also were au pairs. One Swedish, one Dutch and another Danish girl. I probably took a taxi a few times, however my au pair family did let me drive one of their cars. In the summer on days off, we would often hitch hike to the beach, usually some housewife picked us up. Either they had or use to have au pairs. I always felt safe in Westport. Some of the young locals that became our friends had cars, and was pretty generous given us a ride when we needed one. Condolences to the Keehan family. I had the great fortune to work for Leo in the 1970’s as a Maxi Taxi and Minnybus driver when home from college during summer and holiday breaks. Also got to enjoy his company and sense of humor off the clock as he was a family friend. A genuinely great guy. One small correction: Leo graduated from Staples in 1947, not 1948. I only met Leo for the first time a year ago. It was the first of what became almost weekly conversations while renovating the house next to his. Fairly quickly I found myself looking forward to our next conversation. A lifetime of experiences and a sharp mind with which to share them. Always enjoyable. I will miss him. My wife and I first moved to Compo Beach back in 1992. Two weeks later the worst flood in many years hit Compo. That is how I met Leo. We were all cleaning up afterwards and even though he had plenty to do himself, he offered his assistance in any way he could. I remember him telling me if I needed tools of any kind to just go in his garage and grab them. We had been friends ever since. In recent years I did not see him very often but when I did, usually when I was coming back from a run, I might find him outside grabbing his newspaper or mail and we’d chat it up. I am sorry to hear of his passing and my family extends their condolences to the Keehan family. I will surely miss his presence in out neighborhood.